Netanyahu's Victory: The masks are down. Talking about the Israeli elections, the results and its meaning for the Peace Process, let start first with figures. The result is that Netanyahu got 57 seats all together with the right and religious parties’ bloc, and the left-center bloc parties got 53. In the middle there is a centrist party – Kulanu which is quiet moderate according to their declarations made before the elections, got 10 seats. But since this party descent from Likud, the assumption here is that Netanyahu with his 57 seats in the Parliament can form a coalition together with it – so they’ll form the coalition uniting 67 members of Parliament. In the previous elections the right religious bloc all-together had 61 seats. And actually what happened in the current elections is that the right wing parties and the religious forces have lost 3 seats in the Parliament, as Netanyahu took the seats from the ultra-orthodox parties, from the right-radical parties, and became bigger (30 seats), than the second party in the Parliament, which is the Zionist Camp (the former Labor party with 24). And so he gains the right to be the first to form the coalition. So, from my point of view, he made a big victory, but this victory was due to his expanse on the right wing radical parties. And mostly he has done it in the last three days before the elections, because most of the polls predicted him gaining 20-21 sits in the Parliament and he gained 30. So it was a big failure for the pollsters and for the media in Israel, because all of them had been assuming, that the Labor party and the Zionist Camp would win the elections and it appeared to be a disinformation. The real change was between parties but not between the two blocs of the political arena. There were also two very bad declarations of Netanyahu, as he stepped out of the Two-State solution and he incited the Arab population in Israel. And by this kind of announcement he gained the popularity among those who are ultra-right and ultra-orthodox. Many voters from the radical nationalist party ‘The Jewish home’, ruled by Nafrali Bennet moved to Netanyahu’s camp. Bennet had 12 seats in the Parliament previously. Now he has only 8. And all the seats he lost, he lost because of Netanyahu’s announcement that he is not in favor of the two-State solution anymore. That was a game changer in the last three days before the elections. We should understand also, that there is a big discord inside Israel, inside the Jewish population. We can even say that there are two states in Israel, as the society is divided to 2 blocs. One part of the Israeli society supports the Zionist Camp and the Labor party,’Yesh Atid’ party and ‘Meretz’.It is characterized by a very high gross national product, liberal values of cooperation with the Arab minority, diplomatic moderation, pragmatic security viewpoint. The other bloc is formed by ‘Likud’ party, The ‘Jewish home’, The Ultra-religious parties and Liberman party ‘Israel Beitenu’ . Most of that part is haunted by archaic fears it is prickly, isolationist and conservative and suspicious of the Arab neighbors .with small-income salaries. And however, they suffered a lot from the last years of Netanyahu’s internal social and economic policy, they’ve voted for him. The result is that it is easier for Netanyahu to form a coalition, than for Labor Party and the Zionist Camp headed by Isaac Herzog. As far as the future of the Peace Process is concerned, it should be reminded that in the end of the month the gathering of the Arab League will take place in Egypt. And I think that the Arab League will stay with the Arab Peace Initiative declaration. And I think, there is a possibility that Netanyahu would be set to say that he is for collaboration with moderate Arab states, as Saudi Arabia, the Gulf States, Jordan and Egypt. He understand that main topic that interest Arab leaders is the fight against ISIS and stemming the expansion of Iran. The problem is that he wants to bring this ME collaboration without the Palestinians and in this case there will be no kind of diplomatic solution, and this would even paralyze the negotiations on the matter. Personally, as well as my organization, NISPED-AJEEC and the Peace camp in Israel, we strongly support the API and we see it as a right base for negotiation for peace together with the Palestinians. But the future for us, at least the nearest future, looks very gloomy. I must admit we don’t see any advancement in the Peace Process. One good thing is that the masks of Netanyahu and his government supporting the Peace Process and declaring the Two-State Solution do not exist anymore. One good thing is that the masks of Netanyahu and his government supporting the Peace Process and declaring the Two-State Solution do not exist anymore. The first announcement of the US administration was saying «Ok. So everything is clear now». That means that the US is not going to stop the Palestinians, with their attempts to settle the conflict through the UN institutions. And this would probably have good consequences for the situation, compared to what we witnessed in the past, when the US had been automatically supporting everything Israel had been doing. And it was not helping Israel at all. I must admit that I didn’t like the way Obama was reacting to the Netanyahu’s speech to the Congress. He publicly hazed the president and got home safe and sound without paying any prize. The people of Israel saw no act of the US administration when Netanyahu behave like this and they understood that he defeated Obama. It was a big mistake of Obama. I don’t believe that Netanyahu will be in practice more flexible on the two-state solution after the elections. In the past Netanyahu had been speaking more politely but had no intention to build it. He has been opposing this idea from the first minute. He had been declaring that he supports the conflict settlement on the basis of the two state solution on the international arena, while inside the country, for the home audience, he had been saying, that he don’t believe in it. But of course it was a populist move to gain votes, but the question is what he is going to do after the elections. There is an important question if he is willing to enter the real negotiations on the two state solution or no. The Kerry initiative has failed, as Netanyahu didn’t want to draw the lines of the borders. He just wanted to stay in power. He is not willing to step into real negotiations and find a solution. He is a Mr. Security, declaring that he will secure the Israelis against Iran, against ISIS, against the Palestinians not believing in the two-state solution. There is a big question whether this strategy and this policy can exist in the Middle East and in the modern world now. I don’t believe in this. But people actually vote for this policy. This policy will be of becoming isolated, conservative, to prefer any religious values over the democratic and liberal ones, to be a state that is suspicious of its neighbors. Alongside the damage created by the latest and still-ongoing war between the Palestinians and the Israelis, one can see that the Arab Peace Initiative is gaining more ground this time not as a point of departure for a comprehensive Middle East solution, but as an umbrella for a comprehensive solution to the Israeli-Palestinian conflict. Egypt, Jordan, and the Gulf countries seem to be ready to play an active role in that direction. The latest war that started in West Bank on the 3rd of June 2014- directly after the abduction of the three young Israeli settlers- and then moved to Gaza, was one that was possible to be avoided if the Israeli government did what democratic countries do with such an event of the abduction of the three young settlers- that is by searching for the assailants and bring them to justice. Instead, the Israeli government launched a big campaign of invasion and detention in West Bank and East Jerusalem, while the Israeli extremists killed the young Palestinian Mohammed Abu Khdeir which by itself created the solidarity of the non-Hamas factions in Gaza whom started launching rockets against Israel, with Hamas later on joining after its Al-Qassam Brigade fighters were killed by a shelling of an Israeli jet. This also happened in a period when Hamas showed more moderation by supporting from the oustide a technocratic government that President Abbas composed and accepted the PA’s return to Gaza. It was a war of choice, initiated after the failure of the Kerry Initiative to get the two sides to an agreement. Kerry himself warned several times that violence might erupt if his initiative failed. It is also not a war against Hamas; it is a war against the Palestinians, with the aim of pushing them to accept the status quo of continuous occupation of the West Bank, and the control of Gaza strip and keeping it under a tight siege. The high causalities among the civilians and the massive damage of homes, schools, mosques, factories, and institutions indicates that the war is against the Palestinians. One can notice that it was part of the interim agreements of 1994 and 1996 between Israel and the PLO to create an airport, seaport and fair passage between Gaza, West Bank and East Jerusalem. The first two were created by the end of the 1990s and several proposals were developed for the third. During the second Intifada, Israel destroyed both the airport and the seaport. Now the Israeli government claims that these issues are part of a permanent status agreement and not the interim one! If this is the case, the indirect Cairo negotiations should be transformed to negotiations of the comprehensive solution of the Israeli Palestinian conflict rather than having them as discussions about partial issues such as the amount of permits that Israel will increase for those who pass the crossing borders and the number of trucks of goods allowed to Gaza and others alike that lead to minimizing the Israeli siege around Gaza rather than lifting it as the Palestinian delegation demanded. The new process should be about finalizing and not about reaching a new sustainable temporary arrangement that will keep Israeli control, as was the case. When one looks the Palestinian demands, he/she will find these demands as fair and are about linking Gaza to West Bank and Jerusalem, and vice versa (signaling also the lack of freedom of access of West Bank Palestinians to Gaza), and also the seaport and the airport in Gaza should be for the use of all the Palestinians as it was clear in the interim agreement about them, leading also to the free passage that was presented as necessary for the West Bank Palestinians in order to reach the Gaza sea port and the airport for use. The establishment of the airport and the seaport will mean that the Palestinians will have their symbols of independence instead of depending on the airports and the seaports of the neighboring countries in order to travel and to exchange goods. With Egypt taking the leading role on the negotiation as the biggest country in the region, the API is brought in as an umbrella to these negotiations that will lead to the presenting the issues of the Palestinian independence as the issues of the negotiations, rather than the previously-traditional failed way of discussing an issue after the other. In other words, it should be negotiations aiming to demarcate the borders between the two states in West Bank, East Jerusalem and Gaza, and decide on the modalities of the relations between the two states. In this regard, the issue of lifting the siege on reciprocal freedom of movement of individuals and goods between the West Bank, Gaza, and East Jerusalem is a national Palestinian independence issue, and thus it should be solved accordingly. This is the way out, and Egypt looks to be ready to play such a leading role. In order to support Egypt doing so, a coordination between the Arab League, the Kuwait leadership of the Arab Summit, and the Arab Peace Initiative Follow-Up Committee will be necessary, and moreover a UN Security Council resolution will be needed in order to define and support this new process for the two states, and an international conference will be required in order to launch and create a new international bid of support and follow up on it, leading to the results on an agreement upon a time frame. The Arab Gulf countries, Jordan and the Palestinian Authority will be in support of such a process, creating with this an operationalization of the API on the Israeli-Palestinian track. Additionally, Hamas will also be involved in it, being part of the united Palestinian delegation to the Cairo negotiations, leading to peace with all the Palestinians- not with part of them to be against the other, as the conspiratorial proposals presented plant seeds to trigger upcoming wars and internal Palestinian fights between the so-called “moderates” and “extremists”. Nowadays, with the Palestinians, regardless of their political color, are waiting to see if the Israeli government will be ready to pick the opportunity and change its directions to peace with all the Palestinians, instead of seeking to “divide and rule”, or seeking- under the API umbrella- to “subcontract” by Israel the moderate Arab countries in order to come to Gaza to disarm Hamas there - as presented in several Israeli proposals- something that will not happen given that none of the Palestinian and the Arab moderates will be ready to accept an offer that is less than the Palestinian independence, and then ally with Israel against other Palestinians. Such wishful thinking will never happen. In the framework of IMESClub-CDCD partnership "Promoting the API" we share the most recent piece by Dr. Walid Salem, IMESClub member. First: Getting the Israeli political arena to move forwards on accepting the API as a point of departure to a comprehensive Middle East peace, starting from the operationalization of it in the Israeli-Palestinian track. Second: Use the good offices of the API Follow-Up Committee to elevate Palestine to statehood internationally, in order to create better symmetrical position to the Palestinians with Israel in any future negotiations. Third: Call for an API based regional approach that can play the role of support for the Palestinians and present incentives to Israel in order to move the peace process forward. The main significance of the API is in its presentation as an initiative that represents the consensus of all the 22 Arab countries (and subsequently all 57 Islamic countries) making it a plan of all Arab countries and not only so-called ‘moderate Arab countries’. Therefore the Israeli acceptance of the API will lead to a comprehensive peace with all the Arab (and Islamic) countries regardless of their ideological differences. Upon that, it should be stated clearly that the calls made nowadays to use the API to ally with moderate Arab countries against the extremist ones and against Iran is a non-starter; additionally, it contradicts with the internal logic of the API itself. The API is about comprehensive peace between Israel and all the Arab and Islamic countries with the Israeli withdrawal of all occupied Palestinian and Arab territories of 1967; it is not by any means about allying with some Arab countries in order to wage hostility or a war against other Arab or Islamic countries. Furthermore, the API cannot be used to bring in Arab countries to insert pressure on the Palestinians to make compromises. President Abbas and the Palestinian leadership have already made all the concessions needed, yet the response by Israel has been more settlement expansion and more extremist positions in contradiction to any agreement with the Palestinian leadership. Therefore pressure of the API should be placed on Israel and not the Palestinians. One way to do so is by elevating Palestine in the UN to create better negotiation position for the Palestinians with Israel in any coming negotiations, in addition to other incentives (both positive and negative) that the Arabs can use to move the Israeli stances forward. The Arab League created two mechanisms for the API promotion/implementation: firstly by delegating Egypt and Jordan to communicate the API with Israel, in which both countries have carried out countless efforts and it is about high time Israel reciprocated instead of presenting proposals highlighting the use of the API as a point of departure to normalize relations with some Arab countries against others. The second mechanism consists of the API Follow-Up Committee taking responsibility to communicate the API with the international community. This committee met 5 times with the US Secretary of State John Kerry during the last 9 months-round of the Israeli-Palestinian negotiations. Recently they met twice in Cairo on 29/11/2014 and 15/01/2015. During unilateral meetings and ones with John Kerry, the API Follow-Up Committee focused on the issue of elevating Palestine in the international arena in order to give it better symmetrical position on the negotiations table with Israel. Statements and actions of the Committee testify to this. Thus, calling the Committee to act in order to pressure the Palestinians is contradictory to what the Committee itself is already doing. Moreover, this demand to pressure is too much to be asked for when the API has been around for 13 years without a positive Israeli response. In actuality, what is needed is positive responses from Israel rather than pressure on the Palestinians to compromise. Finally, an API-based regional envelope can be created to serve as an umbrella for the Palestinian-Israeli bilateral negotiations. Such a regional envelope will not be a forum for alternative negotiations with Israel as Primw Minister Netanyahu and Foreign Minister Liberman wanted. Neither should regional negotiations be conducted in parallel to bilateral negotiations leading to Arab-Israeli normalization before the Israeli withdrawal or another round of controversy similar to the one of the 1990’s Multilateral Working Groups on what would come first: normalization or withdrawal? Subsequently, such controversy led to the collapse of the Multilateral Working Groups. The “alternative” then is a bilateral Palestinian-Israeli negotiations supported by a regional API-based umbrella that works in concerted efforts with the Quartet for Middle East peace as was emphasized in a statement by the Quartet itself last week as a result of its meeting in Brussels. The Arab Peace Initiative. A setback or new horizons? 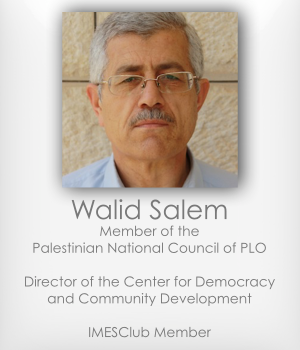 In the framework of IMESClub-CDCD (The Centre for Democracy & Community Development) partnership we share the latest paper by Walid Salem on the future of the Arab Peace Initiative after the August Israeli war against the Palestinians. "A setback or new horizons?" – read the text to discover the answer. "During the last June – August Israeli war against the Palestinians in the West Bank, East Jerusalem, Gaza, and the Palestinians inside Israel, several new proposals were presented by the different Israeli leaders regarding the API. It seemed as if the Israeli leaders had rediscovered the API after 12 years of its presentation. In this regard, proposals about it came from Lieberman, Netanyahu, Yair Lapid and his “Yesh Atid” Party colleague Yaakov Peri, and Tzipi Livni; along with former official security leaders Amos Yadlin, Youval Diskin, and Shlomo Brom. <...>"
Another 100 years of conflict... Unless…? The Palestinians lost twice already in their struggle against Zionism: One when it was led by the seculars, and now when it became to be led by the religious right wing coalition. When it was led by the seculars, those seeked to have the Jewish state in the Palestinian Coastal heart-taking magnificent areas. With that the Palestinians lost their coast, but also had maybe more importantly they lost the coastal culture, which was about openness to the other, diversity, tolerance and participation. They were left with the mountains areas of West Bank with its conservative culture, and the periphery of the coast (Gaza Strip) in addition to East Jerusalem as a town that lost its notables in 1948, and was left with a type of middle class that provides services to the Muslim and Christian Pilgrims to the city during the period of 1948 to 1967. When the religious- right wing coalition take over the leadership in Israel starting from 1977 change in the Israeli government, those seeked the Israeli dominance over the Jewish religious places in West Bank and East Jerusalem, further they were able to move the language of the supposedly left wing labour party to become more religious, especially in regard to the Jewish holy places in Jerusalem, as happened with Ihud Barak in Camp David negotiations in the year 2000. With this coalition prevailing the Palestinians might be about to lose 1967 territories almost in the same way that they lost 1948 territories. How? With what described above, the situation is not anymore about “Peace for land” from the Israeli right wing coalition, but more for “Peace for process”, were the process will become the alternative to the “Peace Process”, the right wing coalition needs such a process in order to be the cover of the shift that already took place from the “temporary occupation” formula of the 1970, and 1980’s, to the “permanent occupation” formula that is adopted nowadays. The adoption of such new formula, came as a result of the settlement expansion (300,000 inhabitants in West Bank, and 200,000 in East Jerusalem, that created the idea of: since we build all of these settlement, so why to demolish them, and more over: why not to build more? This move to permanent occupation formula is the one that explains why Israel prevent any building in Area C comprising of 64% of West Bank, and explains what is going on in East Jerusalem, moreover it explains the current mood among the Israeli public opinion, who consider the current situation as less risky of any peace agreement, therefore the common “wisdom” became a one that want to keep occupation, and to have peace in the same time. Those who spend their time then analyzing what should be the better solution: The two states, or the one state solution, should know that this discussion is irrelevant, because the Israeli policies already united all the country as one state that is all under Israeli dominance. This is obviously against both the two states and the one state solutions. In this regard they consider the West Bank and East Jerusalem territories as holy to the Jews, therefore they consider these lands as Israeli. In regard to the Palestinians living in these lands they consider them to be a “population” that should not be given more than a self administration as much as they accept the Israeli dominance, and if not they should leave to Jordan. In other words the Palestinians rights towards the land are not reconsidered, and the same the Palestinian collective rights as a national group. With that the historical land of Palestine to be united under the Israeli authority, while the Palestinians to be dealt with as scattered population that have no rights as citizens. Therefore, the process is not in the direction of one state solution for both peoples, but a process towards one state solution that is without the Palestinians. How? Such right wing coalition, with such ideas and practices, if not stopped, will continue the process of taking the ground from under the feet of the Palestinians, a process that happened gradually before 1948 leading to the forced migration of the Palestinians of that time. The fear of such new Palestinian exodus is high, given also that it happened already twice historically, one in 1948, and the second in 1967. The described above might look as impossible, but it looked also impossible in 1930’s, then it happened in 1948. Why?. Because the dynamics emerging from the settlement expansion at that time created processes of uprooting the Palestinians, when they found themselves outside the country at the end, Today also if the settlement expansion will continue, then it might create the same dynamics. When some observers saw that the current global realities are not the same like of what was in 1948, one should notice in the opposite that in Israel today there are right wing groups who are ready to have a confrontation with the world, and ready to pay the price of such confrontation, whatever such price will be in the path for taking over all the historical Palestine. The current growing tension between Israel in the USA (reminding of the one with the British Mandate in Palestine in 1940’s), is still in the beginning, and it is expected to heighten in the coming future. None of the political solutions presented nowadays looks relevant or possible, the bilateral negotiations if resumed will create again an endless process of negotiations, the proximity talks if conducted will lead to endless discussions about the conditions of resuming the negotiations, the international Quartet imposed solution is not on the way, and it will declared it will be impossible to implement it in the ground without bringing international or multitelaral forces to the ground of Israel Palestine which does not look likely to happen. The Arab Peace Initiative also do not look like to move with the continuous Israeli rejection of it. Further than that, when the two states solution became more accepted internationally, and in the Israeli society, the path to it is closing practically with all the Israeli procedures and activities in the ground. In this regard the Fayyad government two years plan, looks to be the last attempt to get to the Palestinian statehood through the Palestinian unilateral track that it initiated, but this plan still to be tested in two issues: How it will be implemented in Area C and East Jerusalem, and how it will re-unite Gaza with the West Bank?. The Failure to solve these two issues due to the Israeli restrictions will lead the plan to end by being the “Economic Peace” plan of Binyamin Netanyahu. Since all those strategies presented hereinbefore will not work, the Palestinian public wisdom created another exist strategy, while some observers spend their time questioning if there will be a Palestinian third Intifada or not, and if there is a fatigue among the Palestinians or not, the Palestinian people already created in the ground their third Intifada, which was called by the Israeli professor Shaul Mishal as “The White Intifada”. Unlike the previous two Intifadas, this one is not looking for quick results, it acts and work to be permanent, as much as the occupation is permanent. This is its first characteristics. Its second characteristic is that it is multidimensional. In one hand it expresses itself through the nonviolent activities against the wall in 15 locations such as Balien, Ne’alen, Al-Ma’asarah, Um-Salmoneh, and Shiekh Jarrah. In second hand it expressess itself by the high adoption of the UN “equal rights discourse”, and carrying this discourse to the UN security council, and all the UN and non-Un world structure, using also in this regard the international decisions on the Palestinian issue, and calling for their implementation. In this regard it includes a variety of activities: Field activities, legal ones, diplomatic ones, and etc. Its third characteristic is that it brings together the Palestinian-Internationals, and the Israeli activists against occupation together in the ground conducting the activities all the way ahead together. Its fourth characteristic, is that it includes concerted and coordinated efforts of the civil society organizations, grassroots organizations, and the PA together, were all are participating in its activities together. This white Intifida is recruiting today more and more international support, especially after the Israeli Army crimes during the last war in Gaza, now the calls for divestment, boycott of the Israeli settlements products, and the calls for sanctions against the Israeli government policies are becoming louder and louder. Also the calls on the PA to stop the security cooperation with Israel if there will be no peace process any more are going up, in addition to those calling for resolving the PA, while it might be doubtful that this last thing might happen. In the future, this white Intifada might create more support in the Arab world (including the Arab countries campaign against the Israeli Nuclear power), and more importantly among the Palestinian, in Israel, and other segments of the Israeli society. Now, it is a new type of Intifada, very slow, and very patient, it is based on the assumption that there are no solutions in the horizon in the short run, therefore it builds for the future, and for accumulating changes for that future, depending on the Palestinian human capital, and supported by the region, the globe, and the Israeli peace camp human capital. The API Regional Network was established by the CDCD and AJEEC-NISPED as part of their project “Building Sustainable Regional Peace based on the API”. This project is funded by the European Union. 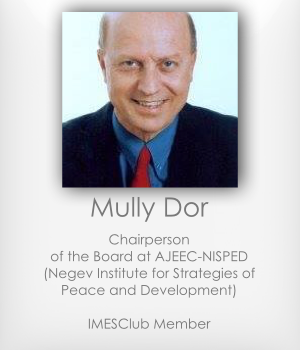 In the IMESClub-CDCD partnership framework we present you a paper by Miles Mabray. "This proposal is the result of multiple discussions, conferences, workshops, and papers that have been conducted and written in the past few years of the peace process. The inspiration for this proposal came from discussions that took place over the course of three days (August 15–18) in a European capital among approximately fifty politicians, ex-politicians, and civil society actors from the United States, Europe, Israel, Palestine, and several Arab and other Muslim countries, regarding the possibility of creating a regional envelope to reinforce the initiative of U.S. Secretary of State John Kerry for Israeli-Palestinian negotiations. This proposal explains and outlines the construction, implementation, and promotion of a regional envelope of support for the peace process."